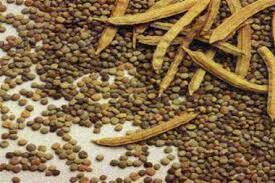 ~ Rs 2,000 a month short of guar seed prices. ~ Guar gum prices to Rs 4,500 / quintal fall. ~ Prices of these respectively 9,000 and Rs 27,500 a quintal. ~ Rajasthan - 20,000 bags daily arrivals in Haryana. If this was a normal monsoon Kharif guar and guar gum prices are likely to decline. Producer prices in various markets throughout the month of guar seed and guar gum prices to Rs 2,000 and Rs 4,500 respectively come down: Rs 9,000 and Rs 27,500 a quintal ceased. Producer's total production of guar in markets around 40 to 45 per cent higher stock prices, while export demand remains weak.